In the March issue of Automobile magazine, Ezra Dyer recounted his experience with Progressive insurance's "snapshot" system, the latest innovation in trading privacy for money (which we all seem pretty well inured to these days). Customers who sign up for snapshot receive discounts for "safe driving," which is measured with a device that transmits data to Progressive from your car using the cell network. According to the rules, Snapshot can generate a discount but not a surcharge -- unless you live in Rhode Island. The device logs your speed, but that's not a factor in the calculations because Progressive doesn't know where you are -- you might be doing 65 mph in a 70 zone or 45 mph through a car wash (although one wonders if a few trips into the triple digits would disqualify you from a safe-driver discount). The deciding factors are what time of day you drive, how far you drive, and how forcefully you brake. If you're approaching a yellow light, Snapshot is an incentive to risk running the red rather than hitting the brakes. If a deer jumps out in front of you, Snapshot would prefer that you swerve into the oncoming lane rather than mash that brake pedal. That is, the past relationship between braking behavior and driving safety reflects the behavior of agents under one set of incentives - if you change their incentives, their behavior will change, and the previous relationship between braking and safe driving will no longer be valid. What Progressive really needs is a "structural" model that embodies the underlying preferences of their customers, which will be invariant to the policy change. Of course that's a much harder thing to do (as macroecomists have discovered over the past several decades...). 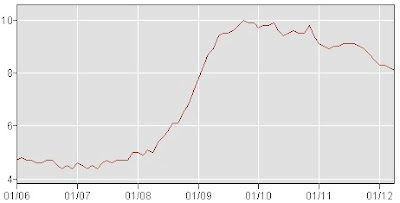 According to today's report from the BLS, employment rose by 115,000 in April and the unemployment rate ticked down to 8.1%. The employment figure comes from a survey of businesses and is roughly consistent with a pace of job growth needed to keep the unemployment rate steady over time, but not nearly fast enough to bring it down. The unemployment rate is calculated from a survey of households. Unfortunately, the reason for the decrease isn't gains in employment, but rather a decrease in he labor force (the number of people who are working or looking for work, which is the denominator in the unemployment rate calculation). In the household survey, the number of people reporting that they were working decreased by 169,000, while the labor force shrank by 342,000. 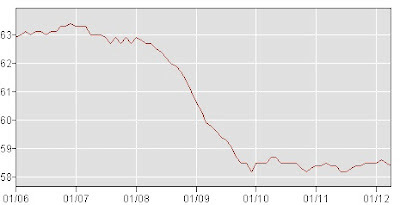 That brings the employment-population ratio down to 58.4 and the labor force participation rate is now 63.6. 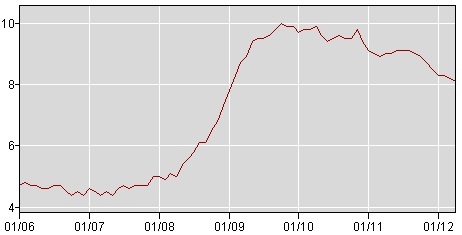 The improvement in the unemployment rate over the past year (it was 9% in April, 2011) is due to the fact that the labor force has grown slowly relative to the population. Compared to a year ago, the "civilian noninstitutional" population (over 16) is 3.6 million higher, while the labor force has only grown by 0.95 million. The number employed has increased by 2.2 million. 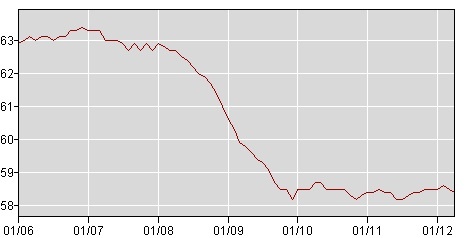 The employment-population ratio is the same as it was a year ago. The declining labor force participation is probably a combination of demographic factors and discouragement. April is a month with a large seasonal adjustment, and the month when the adjustment switches from positive to negative. On a non-seasonally adjusted basis, the unemployment rate fell from 8.4% to 7.7%, the employment-population ratio rose from 63.7 to 64.1, and employment grew by 896,000. That is, comparing the adjusted and non-adjusted numbers tells us that April is always a month with big employment gains, but this month's weren't impressive relative to that pattern. There has been some discussion about whether the seasonal adjustment is slightly off, partly because of the warmer than usual weather this winter, which would mean that some of the hiring that normally might occur in the spring could have happened earlier. The February and March payroll employment figures were revised upward a bit, by 19,000 and 24,000 respectively. Overall, this report is consistent with the picture we've had from most of the data releases over the past year of an economy that is growing, but not quickly enough to make up for the ground lost in the 2008-09 recession - i.e., to close the "output gap." 12.5 million people remain unemployed. Update: More reaction from Brad Plumer, Greg Ip, Floyd Norris, Mark Thoma, Calculated Risk, and the econ "twitterverse".